Packing up all of your household belongings is a lot of work. It can take weeks for a family to pack up all of their belongings in preparation for a move. When you have King’s Transfer pack your belongings that same job can often be done in a single day. We know your time is valuable -, use King’s Transfer packing service to save a ton of time and have your breakables and personal belongings packed by trained professionals. King’s Transfer can take a load off your mind. Do you need either short term or long term storage? Whether you need to remove items from your home while you renovate or stage your home for sale, or you need storage between homes, you can call King’s Transfer. Any time you need to empty, reorganize or reduce the contents of your home, King’s Transfer has a solution for you. Our storage facility is heated and fully insured. 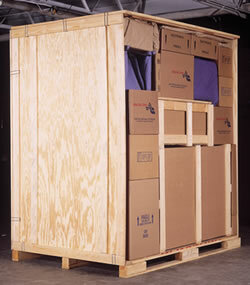 We also offer bonded storage for any international shipments. Whatever your storage needs are, King’s Transfer can accommodate you.